In what’s as natural a combination as chocolate and french fries, Final Fantasy XV and Assassin’s Creed Origins will have a crossover that Ubisoft says “will result in the two franchises paying homage to each other’s gaming universes.” It’ll start next week with a festival inside FFXV. The collaboration kicks off on August 30, as Final Fantasy XV players who have obtained the Dream Egg from the Moogle Chocobo Carnival event will be gifted a very familiar Assassin outfit for Noctis. The very next day, August 31, will be the release of the free Assassin’s Festival DLC for Final Fantasy XV. The town of Lestallum will transform itself for the event with signs and banners signaling the arrival of the festival, and new activities will be available for players to participate in. It doesn’t end there. 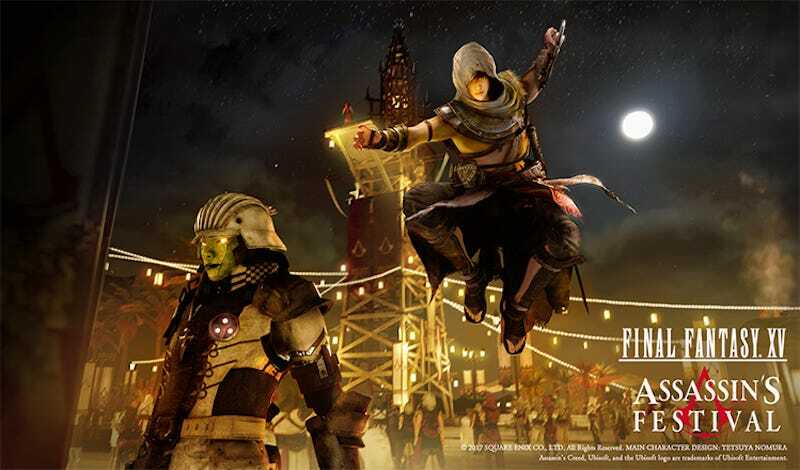 The Assassin’s Festival will have some additional themed items and features, including another outfit from Assassin’s Creed, along with abilities that enable Noctis to explore more like an Assassin and even use some of the Assassins’ more well-known abilities. Assassin’s Creed has had marketing collaborations with other games before. In Metal Gear Solid 4, for example, Snake could dress up as series protagonist Altair, and in Assassin’s Creed Brotherhood you could find a Raiden outfit. But this might be the most bizarre crossover yet. Here’s hoping Assassin’s Creed Origins has a mummy dressed up like Gladiolus.